Can anything spell the impending doom of climate change quite like an abandoned, flood-damaged ski shop? That is the starting point for devised theater company Piehole's new production, Ski End, the story of a group of friends who discover the apocalyptic building and summon the ghosts of the small town folks who once made their living there. The deconstructed piece directed by Tara Ahmadinejad and created by the ensemble examines the life-changing effects of climate change on a small group of people who can then stand in for a much larger population, facing much higher stakes. The piece begins playfully, featuring extended sequences of fake skiing around a large puddle that represents a lake and reminiscing about the high school days of yore, before the threats of online shopping and unnaturally beautiful days. But before long, the specter of an impending winter storm looms large over the group of middle-aged retail workers, and when things seem to be at their bleakest—the group of twenty-something actors are awoken from their haze by a trio of teenagers facing a much more pressing problem. The ski shop is going to be sold. Ski End then delves into another social issue weighing heavily on some minds: the question of who has ownership of abandoned spaces. In contrast to the dreamy memories of the first part of the show, in which time, place and even character names are constantly in flux, the problem these kids are facing is a real and present danger, represented by the periodic appearances of real estate agent Carla scoping out and eventually selling the ski shop while refusing to acknowledge their presence. Carla, in fact, is one of the few elements that unites the production, keeping the wild series of imaginative scenes grounded in exactly the right degree of reality. The bulk of the show, however, consists of the middle devised section in which the five friends explore the ski shop and its history. Dragging through some scenes and speeding through others, Ski End takes time to find itself. While some production elements add new dimensions to the play, including the expert and thoughtful use of video projections and well-timed deployments of dead birds from the ceiling, others are merely distracting. There is an overabundance of smoke machine effects, and the frequent outbursts of choral singing, while beautiful, often do not seem to serve much of a purpose. The set and overall production design succeeds in evoking the perfect mixture of idiosyncrasy and despair, and in its best moments, Ski End delivers on that promise as well. Meanwhile, the incorporation of local New York City teenagers as full members of the company and production is a welcome breaking of barriers, but their dual role as "real" people suffering displacement from their decrepit ski shop hangout in Vermont and as themselves onstage is unnecessary, adding a third layer of reality to the piece that proves distracting. Still, Piehole concludes the piece with a genuine open question, both about this particular issue and many others: what can we do to fix this? For that honesty, a desire for improving the world and the humility to admit they do not have the answers, this ensemble of theatermakers is to be applauded. It may not have a neat ending, but for many of us, Ski End is just the start. 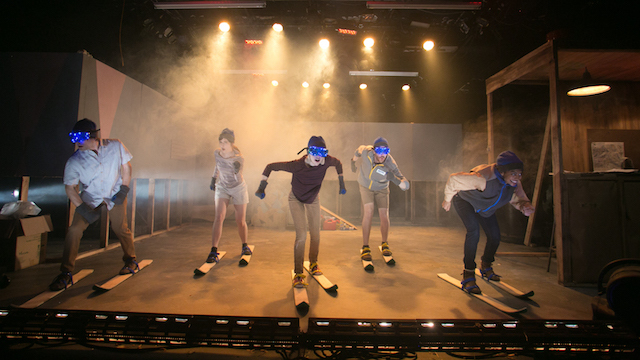 Ski End plays at the New Ohio Theatre through May 19. Thanks for sharing these awesome information. I really likes this weblog publish. Very nice publish. You can made it good blog publish for the users. It was really a wonderful post. I believe that it is largely useful to the readers. It is a good recipe. I am trying this recipe and it is very tasty and good. I am currently working for a one of the https://www.triumphessays.com/">Best essay writing service providing website promotion. This is absolutely a solution for all type of essay writer who struggling to complete to get a perfect essay.